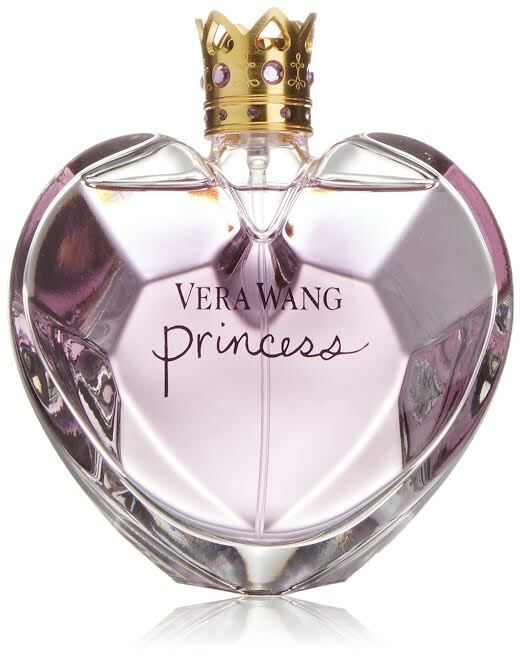 If you like a sweet and gourmand scent, then you definitely will love Vera Wang Princess. It is a very delicious scent, featuring various sweet and fruity ingredients that are enhanced by some floral notes. It is such a pleasant and playful scent that is quite versatile for any season of the year. In addition, it is coming in such a royal packaging design. The heart-shaped jewel-like bottle looks very luxurious that any woman would like to have it on her dressing table. Now, let’s get to know further about Vera Wang Princess! The box of the perfume is somewhat misleading. The purple-themed box appears casual and playful. The box is colored in a lighter purple hue. On the front side of the box, you can find a sketched heart figure that is painted in a darker purple hue and with yellow outer lines. On top of the heart is a golden crown embellished with purple gems. This image is pretty much what you are going to find upon opening the box. Except that the bottle inside is nothing playful. Instead, the bottle appears truly elegant. There is a royal air surrounding it; it is almost like something from the collection of a real princess of royal descent. The bottle appears like a luxurious gem, with a shiny purple tint. The golden cap is shaped like a crown, which opens to reveal a spray head, also in a golden hue. - Playful. Unpredictable. Spirited. - Radiant and whimsical, Vera Wang - Princess is a sheer, fruity floral. The scent sparkles with the captivating, sweet aroma of delicate lady apples and dreamy water lily. Vera Wang Princess is a sheer feminine scent that is best described as sweet, gourmand, and delicious. It is for a beautiful woman who is aware that she is the center of attention. It is savory yet light, highly wearable and extremely lovable. When you wear it, it embraces you with a cloud of sugar and chocolate notes, enhanced by some fresh fruity hints. The top notes consist of apricot, mandarin orange, apple, and water lily. The heart notes are tuberose, guava, dark chocolate, and tiare flower. Meanwhile, the base notes are solid with vanilla, amber, and some woodsy notes. Overall, cocoa and vanilla accords are the most prominent in this fragrance, while the fruity and floral notes ensure that the scent doesn’t get boring. The scent is excellent for day wear, but a little bit too light for nighttime. It is quite flexible and versatile for any season. The sillage is decent, somewhere between soft to moderate, ensuring that it won’t be too intoxicating in a room. The longevity, however, is excellent for an EDT, as it is able to last for several hours. Check the best price of Vera Wang Princess here!